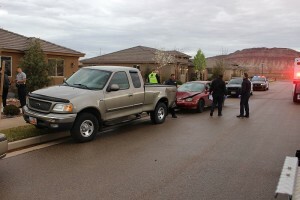 WASHINGTON CITY — An accident in a rural residential section of Washington City damaged two vehicles Sunday morning. A mother and child in one of the vehicles escaped injury. The accident happened at approximately 7:30 a.m. on 4200 South, Washington City Police Department spokesman Ed Kantor said. The airbags in the Ford passenger car did deploy, Kantor said, and the car had to be towed. The force of the impact drove the pickup truck onto the curb, and it was towed from the scene as well. The driver of the Ford passenger car was cited for careless driving, Kantor said.